Jeppe Hein is a bit of a rock star in Denmark, as one of their most celebrated contemporary artists. His installations are usually designed for public spaces, and always invite the audience to be participants, part of the show. Though currently based in Berlin, he’s brought his newest exhibit Please Touch the Art to New York City. Please is an installation in three parts spaced across Brooklyn Bridge Park. First, close to the Brooklyn Bridge and likely most popular with visiting youth, is Appearing Rooms. This set is a raised platform with jets of water that come up to make brief, transitory walls, building ephemeral structures that last just seconds before falling back to the planked floor. Next is Mirror Labyrinth NY, a close forest of mirror-bright stainless steel. They divide the space with reflections and vertical lines, and their shapes echo the Manhattan skyline across the river. 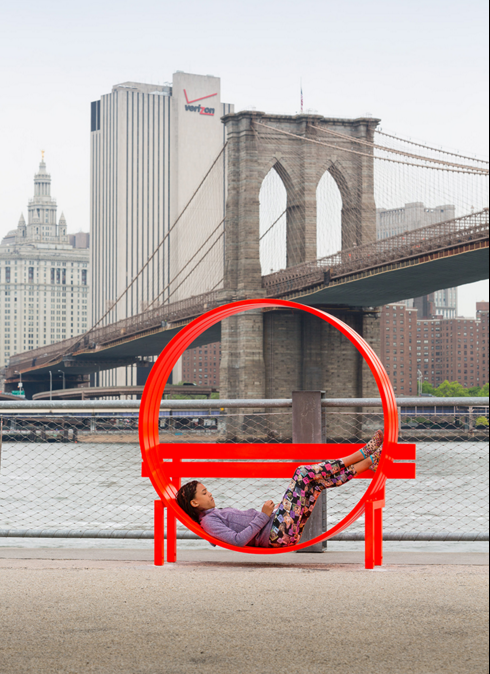 And scattered among these and along the whole length of the riverbank park are the Modified Social Benches, Hein’s whimsical sculptural benches. Some are sit-able, some are more like jungle gyms and require a bit of athletic climbing to find a seat. All are playfully painted in fire-engine red. Nicholas Baume, the Director and Chief Curator of the Public Art Fund since 2009, was behind the choice of Please Touch the Art. The installation will be in place through April 17th, with Appearing Rooms staying for summer, until at least October 4th.